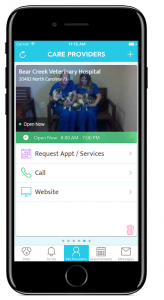 Bear Creek is making it even more simple to book appointments for your furry friend! 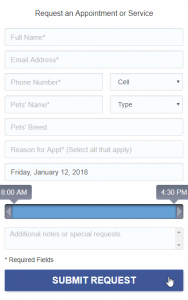 Sign up to get our Pet Desk app for your smartphone and you can make appointments for all your pets right from your phone in just a few clicks! Receive reminders for everything in one place. Access your pet history and vaccines! Get notified when your pet is ready to go home! While we love talking to our patients (and sometimes their humans too ) on the phone, we know it’s not always convenient to call us during business hours. Life just gets busy! To help make us more reachable, we have a new way you can make an appointment online. Whether you are a new patient or an existing one, you can request a variety of appointment types right here on the website. You can make all kinds of appointments right here on the website! New and regular patients can schedule online! You can even request a house call or farm call!